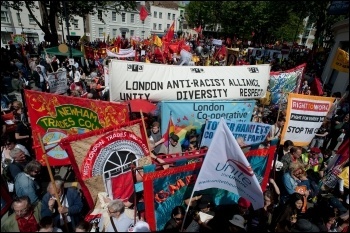 Socialist Party :: Support your newspaper - help us get May Day greetings! Help the Socialist get May Day greetings this year. Because to puncture Trump, and end the billionaires' world austerity barrage, workers and young people need solidarity and socialist ideas. And May Day greetings help fund the newspaper which exists to spread them. Which paper has been alone on the left in arguing for an open, uncompromising fight with the Labour right? Who runs detailed reports from socialists fighting Trumpism in the US? Where can you read about the practical programme needed to win a socialist Brexit? The Socialist. 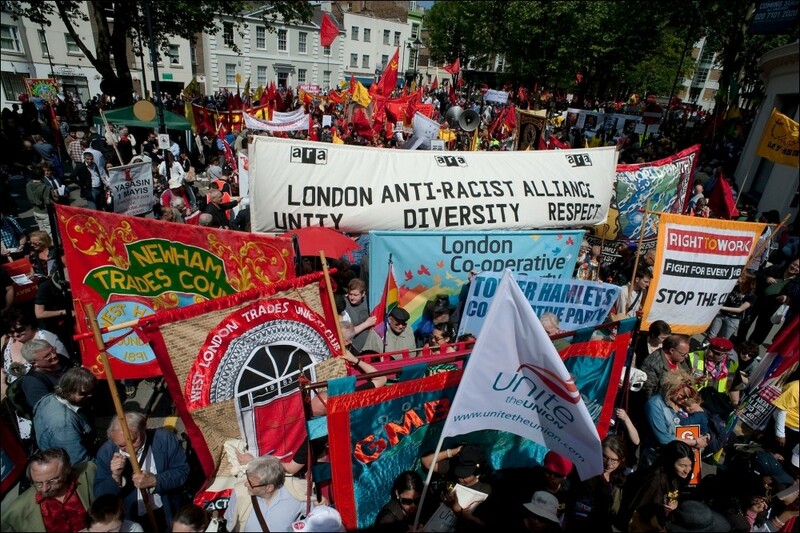 We support and broadcast the strikes and community campaigns the establishment press smears or ignores. Paper sales - and the annual cash boost from May Day greetings - mean we can. Greetings are also a celebration of the class solidarity the Socialist helps to amplify. Groups of workers, trade union bodies, campaigns and student societies all express international solidarity through May Day greetings. How can you help with this? Workers can talk to colleagues about sending a group greeting to the Socialist. We have a petition sheet you can use. Trade union activists should consider proposing motions for their branch, committee or sector meeting agendas where possible. We have a model motion. University students can move that their societies send greetings. School and college students get a special deal: we will place a greeting for whatever you can raise from a whip-round. Socialist Party regions have targets for greetings for the first time this year. Members can ask about helping to organise their branch or region's drive. For May Day resources - and if you have any questions or suggestions - you can get in touch with me. Email jamesivens@socialistparty.org.uk. You can see prices and send greetings at socialistparty.org.uk/mayday.